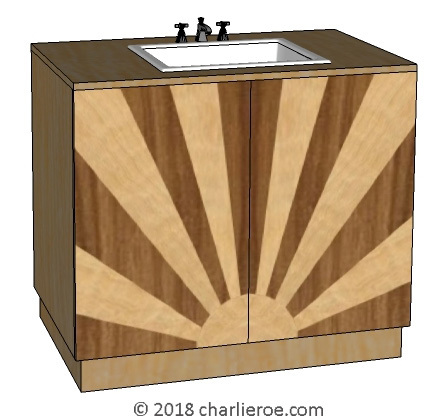 The rising sun design is synonomous with Art Deco, and if a little cliched it is still a classic. We took this idea and played around with it, blowing the scale up to full size on the doors, in an almost Pop Art way. The design works just as well if it is symetrical or asymetrical, as we've shown. The doors can be on push catches, for a clean look, or we can fit handles of your choice. The interior is usually fitted with 1 shelf, but could be fitted out differently if you prefer (bearing in mind there are water & waste pipes to consider). 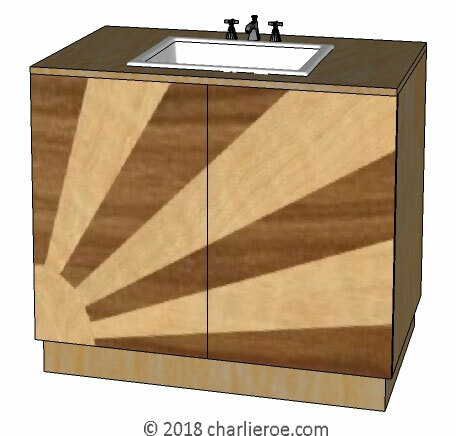 The rising sun designs are made using wood veneers, and marquetry techniques, which requires a high degree of craft skill. 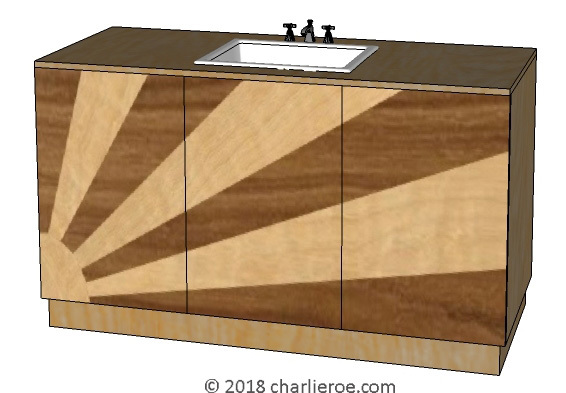 We could use make these using a wide range of wood veneers. We could also change the carcase colour, as made to order. You can change the proportions if preferred, you can play around with the design of such pieces endlessly, from proportions to plinth colour. You can even change the worktop, to stone, granite, Corian, wood, glass, etc. We've shown this with a sit on sink and 3 hole taps, but you could easily see this as an undermounted sink with monobloc tap. As made to order we don't give out sizes until we've agreed a spec with a customer. 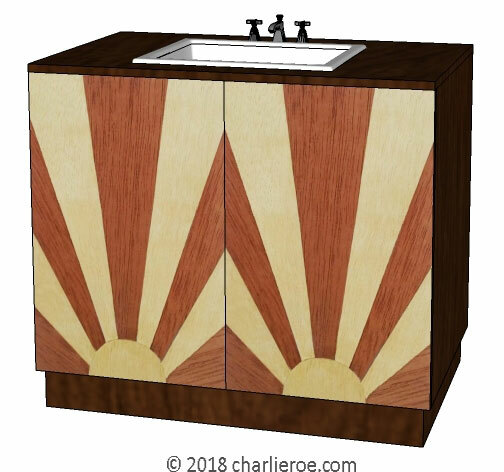 The above 2 cabinets show the symetrical version of the rising sun design, but treated in different ways. We could also make this as a sideboard, with either 3 or 4 doors, as shown below.